Much progress lately! Thursday and Friday I dyed four lengths of muslin in various shades of orange and scarlet, and yesterday I screen printed the yardage with a phoenix pattern to mimic the handwoven fabric that will be used. This morning I began draping. I’m still roughing out the very broad design, and don’t expect it to be finalized until sometime next week, but here’s my process so far. I didn’t like it. I thought about it and eventually realized that the problem was shape vs. color: the striation of the orange-yellow color transition blurred the shape of the orange flame. The original was all about the flame shapes, and the addition of color transitions blurred that, making an unclear design. Now I was quite sure this wouldn’t work: the edge of the flame was lost and the fact that the lines were going in different directions produced complete visual confusion. So I went back to the solid fabric. This doesn’t work. First, it’s pretty boring, visually – the different skirt tiers all blend into each other, looking like a single skirt when they should be distinct. Second, it looks rigid, in a piece that is all about flow and movement. 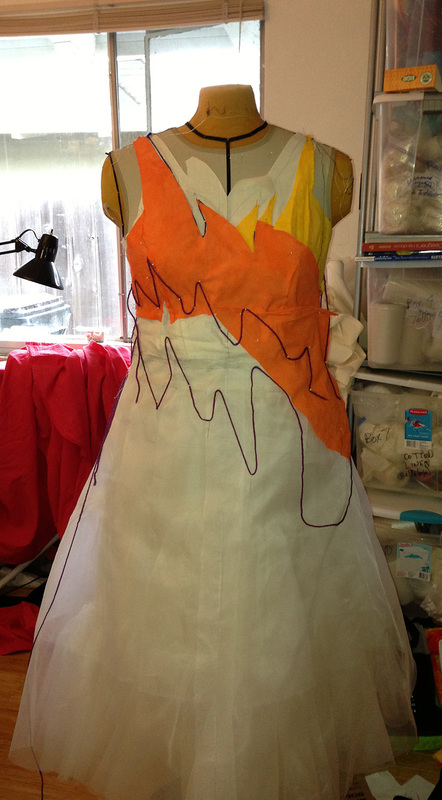 I like this better, tentatively speaking – it has more motion, and you can easily distinguish the tiers of the skirt. 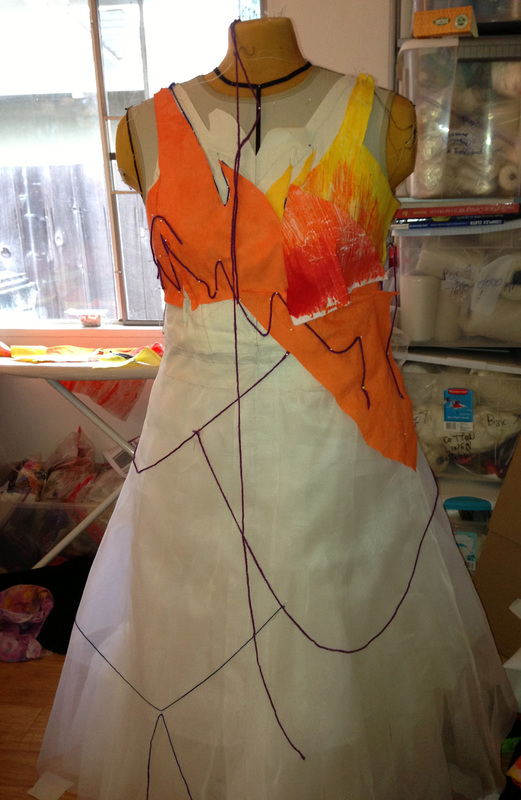 The phoenixes are still flying generally upward, moving the eye up the dress to the torso, but less rigidly. It feels more like a flock of birds swirling in the sky. So I am going to work with this some more. 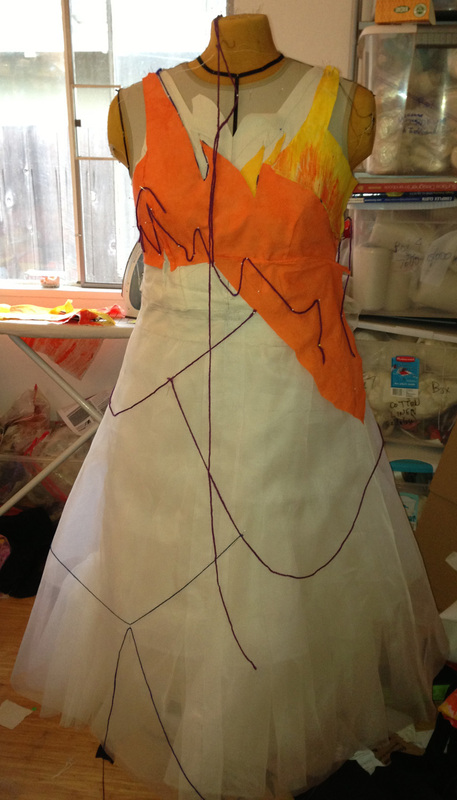 Obviously there is a lot left to do – I haven’t finalized the basic lines yet, much less the flame-shaped borders, and have not even thought about the sides and back – but it’s a good start. And it’s still early in the day, so I have time to do lots of tinkering!